You are driving your car along a narrow two-lane road when a cyclist comes into view up ahead. Of course, you are a lawful, responsible, and respectful driver. You recognize that the lane is not wide enough to safely pass within it, so you slow down. If your sight lines are limited, you follow behind the cyclist until you reach a point with better sight lines. If you are approaching an intersection where you might have to stop, then you follow behind the cyclist until you are past that point as well. If there is oncoming traffic, you wait for it to clear. Then, you move into the oncoming lane, accelerate, and pass the cyclist, leaving them plenty of room for safety and comfort. When you are safely past the cyclist and their forward right-of-way, you move back into the proper lane and continue on your way. No problem, right? Just another everyday driving maneuver. But what if a traffic engineer decided to have a solid double yellow line applied down the middle of that road? Wouldn’t your passing maneuver be a violation of traffic law? So what do you do? Do you call the police to complain about the cyclist? Do honk or yell at the cyclist to move over? Do you try to squeeze past the cyclist without moving into the oncoming lane? Of course not. You’re a lawful, responsible, respectful driver. Do you follow behind the cyclist until your route diverges from theirs or you reach a point where the design of the road changes? That’s certainly a safe and legal option, but it is inconvenient and it seems unnecessary, since you can see an opportunity to pass safely. Or do you just take the first opportunity to pass safely, legal or not? If you are like most motorists, you take the first opportunity to pass the cyclist safely, regardless of the stripe. After all, the purpose of the solid yellow line is to indicate where it is unsafe to pass, and the purpose of prohibiting drivers from crossing a solid yellow line to pass another driver is to prevent unsafe passing. So if it is safe to pass, then why is the solid yellow line there in the first place? Our surface streets have carried a wide variety of low-speed vehicles – horse drawn carriages, bicycles, tractors – since long before the popularity of motoring. Our traffic laws protect the right to drive these slower vehicles while also defining the limited privileges of overtaking for drivers who want to travel faster. For instance, overtaking drivers are prohibited from moving into the path of oncoming traffic or moving left of center where short sight distance would make this unsafe. The traffic laws clearly state that a driver wishing to pass another driver must wait behind them until conditions are safe for passing without interfering with other travelers. As motoring became increasingly popular over the last century, motor vehicle crashes took a tremendous toll in human life. One of the most devastating crash types involves a high speed motorist swerving or drifting left of center on a two-way roadway and colliding head-on with oncoming traffic. Highway engineers discovered that marking a stripe down the center of such roads reduced such collisions by helping drivers keep track of their position relative to the center of the roadway. Marking of stripes in the center of roads that carry traffic at high speeds or high volumes eventually became standard practice. These markings are an early example of “traffic controls” that traffic engineers install with the intent to encourage safe operation in compliance with the traffic laws. Over the decades, traffic engineers have added more and more traffic controls to roadways, sometimes with good results and sometimes with unintended consequences. Because the traffic engineering profession is half hard science and half social experiment, the full effects of traffic controls sometimes take time to reveal themselves. In response to motorist errors, traffic engineers began marking no-passing zones in areas where the sight distance was inadequate to safely pass a vehicle traveling just below the maximum posted speed limit. Some collisions that occur on two-lane roads are caused by motorists attempting to pass other drivers in proximity to oncoming traffic, which might be beyond the passing motorist’s sight distance when the maneuver begins. Although the passing law requires drivers to heed the sight distance required to pass safely, some drivers underestimate the sight distance needed, particularly when passing traffic moving at high speeds. 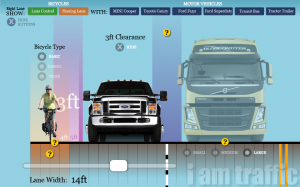 (Other drivers choose to risk passing regardless of clearly inadequate sight distance.) In response to this, traffic engineers began marking no-passing zones in areas where the sight distance was inadequate to safely pass a vehicle traveling just below the maximum posted speed limit 1. A solid stripe became the standard marking for no-passing zones, with dashed markings used elsewhere. 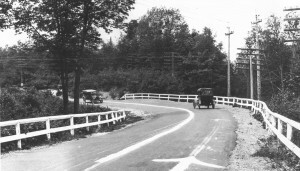 Some states, such as Vermont and Missouri, adopted traffic laws that treated the solid centerline as a warning rather than a statutory prohibition against passing, but most states adopted laws that prohibited passing on a two-lane road wherever a solid centerline was present. Over time, solid centerlines proliferated over a larger percentage of roadway miles. On many two-lane roads, solid centerlines continue for miles at a time, with no dashed sections at all. Over time, solid centerlines proliferated over a larger percentage of roadway miles. Engineers marked them extending out several hundred feet from intersections, in areas with driveways, and anywhere else that the engineers considered unsafe for passing, particularly at high speed. The formulas and tables used to determine where to place solid centerlines assumed that the vehicle being passed was traveling near the maximum posted speed limit1, so that dashed center lines, indicating permission to pass, became quite rare. On many two-lane roads, solid centerlines continue for miles at a time, with no dashed sections at all. Passing of same-direction motorists on two-lane roads declined over time, partly because of the scarcity of legal passing zones, but also due to greater availability of multi-lane roads for longer route segments. Toward the end of the 20th century, traffic engineers saw passing zones to be less important as the amount of low-speed traffic declined (toward extinction, some may have presumed) and many of the motorists who did pass on two-lane roads were exceeding the speed limit. The markings that traffic engineers placed on most miles of two-lane roads did not communicate a reasonably convenient process for passing low-speed vehicles. Yet low-speed vehicles did not disappear from the roadways. Bicycles, thought by many in the mid-20th century to be obsolete, suitable only as children’s toys, later resurged as an economical, healthy, energy-efficient travel mode. Mopeds and scooters continued to be used as an affordable alternative to motorcycles. Horse-drawn carriages remained in use by traditionalist groups and equestrian tour operators. Tractors and construction vehicles were joined by new types of short-range electric utility vehicles. Laws throughout the country recognize a general right to travel on public roadways. At I Am Traffic, we are aware of some troubling infringements on this right, but the law does generally recognize that the public’s right to the road is not dependent on speed capability. But the markings that traffic engineers placed on most miles of two-lane roads did not communicate a reasonably convenient process for passing low-speed vehicles. The system is broken. In some places, highway engineers have attempted to make two-lane roads wider to accommodate passing of some types of slower vehicles, but most roads cannot be widened due to economics. Instead, drivers of low-speed vehicles often become scapegoats for the dysfunctional nature of the road design and lane markings. Because traffic engineers have not considered the requirement to pass low-speed vehicles when designing the roads, many in government treat drivers of such vehicles as “unintended users” and marginalize their use of typically marked roadways. In most of the United States, a motorist is not clearly permitted to cross a solid centerline to pass a cyclist when it is safe to do so. 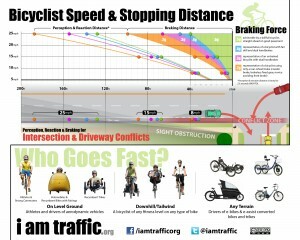 Yet practically all drivers do so rather than continue to follow the cyclist at reduced speed. Drivers recognize that current striping policies for no-passing zones are overly restrictive in the context of low-speed vehicles. Mathematical analysis bears this out. For instance, safely passing a motorist traveling at 35 mph on a 45 mph road requires a sight distance 600 feet longer than passing a 15 mph bicyclist on the same road 2. There is a common provision permitting a driver to cross a solid centerline to pass an “obstruction”. 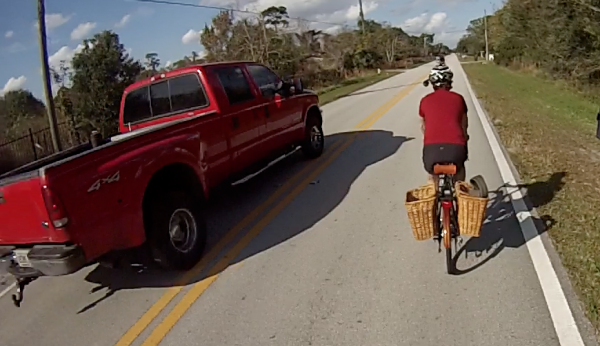 Does a cyclist qualify as an obstruction? Some police departments take this interpretation while others do not. But police department policy is not law and for many reasons cannot take the place of law. Some departments will apply a common exception for passing an “obstruction” to slow moving vehicles. Considering cyclists to be obstructions is not necessarily good for cyclists, even if it seems to work in particular cases. Moreover, considering cyclists to be obstructions is not necessarily good for cyclists, even if it seems to work in particular cases. Other drivers engaged in normal driving behavior are not referred to as obstructions, and referring to cyclists this way is degrading and can lead to further ill treatment in the future. It can even lead to bad outcomes in court proceedings, where the characterization of cyclists as obstructions might be carried into a different context. The legal ambiguity around crossing a solid centerline line is a source of conflict for cyclists, motorists, police officers, and driving instructors. Motorists can be unnecessarily inconvenienced because they believe that they are not allowed to pass a cyclist. Their frustration can lead to resentment and hostility toward cyclists. It can even lead to riskier behavior and crashes. A motorist might honk or yell at cyclists or might buzz them to avoid crossing a solid centerline. In the worst cases, motorists have attempted to squeeze past cyclists within the same lane and fatally struck the cyclists. A cyclist can feel anxious about motorists following behind for too long, as can happen if a motorist believes that passing is prohibited. The cyclist can feel obligated to move to the edge and encourage motorists to squeeze past at an unsafe distance. There is a common belief that cyclists are legally obligated to enable passing regardless of the inconvenience or danger to themselves. This belief is completely false – cyclists’ obligation to facilitate passing is no greater than for other drivers – but the legal ambiguity about crossing a solid centerline exacerbates this belief. People are entitled to assume that the law and the design of roads make sense and will not lead to absurd situations. A motorist who is doing everything right, but can’t get around a cyclist, even if traffic is light, might understandably assume that the cyclist is doing something wrong. Police officers are vulnerable to the same confusion, and may stop or ticket cyclists for bogus infractions such as “impeding traffic” (which by law only applies to drivers traveling more slowly than they reasonable can). The ambiguity about crossing a solid centerline frustrates driving instructors who teach cyclists or motorists about safely interacting with the other. In a typical encounter between a cyclist and a motorist on a narrow two-lane road, the safe and effective technique for the motorist is to wait behind the bicyclist until it is safe to move into the oncoming lane to pass. The safe and effective behavior for the cyclist consists of controlling the lane (taking a position in the lane far enough leftward to discourage motorists from attempting to pass) while there is oncoming traffic or any other conditions that would make passing unsafe, and at other times encouraging the motorist, through a more rightward position and/or gestures, to move into the oncoming lane to pass. This technique is known as Control and Release. However, discussion of these techniques are frequently derailed by arguments over whether it is legal for the motorist to cross a solid centerline to pass a cyclist and when it is legal for a cyclist travel on a road under any conditions in which motorists cannot legally pass them. Can we fix this thing? The long term solution is for traffic engineers to include low-speed vehicles as design vehicles on all ordinary surface roads and to provide appropriate passing facilities depending on context. For instance, important through roads intended to support high speed traffic might warrant more convenient passing facilities than low-speed, low-volume, local streets. Such widespread engineering changes will not be achieved any time soon. In the meantime, an easier fix is needed. A prime candidate for such a fix is a provision in traffic codes that explicitly permits a driver to cross a solid centerline to pass under appropriate conditions. Some states have already implemented this fix. Colorado3, Maine4, Mississippi5, Ohio6, Pennsylvania7, Utah8 and Wisconsin9, for example, have added provisions to their respective traffic codes explicitly allowing drivers to cross a solid centerline to pass a slow-moving vehicle, or a bicyclist specifically, under safe conditions. The vast majority of motorists are already crossing solid centerlines to pass cyclists today. What isn’t happening is a substantive public discussion about how to do it safely. We propose that prohibitions on crossing solid centerlines be relaxed by adding an exception for passing vehicles traveling at sufficiently low-speed. In Ohio, for example, this speed threshold is half the maximum posted speed limit. Such an exception would be applicable to passing tractors, construction vehicles, and horse-drawn carriages, in addition to bicycles. Most motorists already cross solid centerlines to pass all of these vehicles when safe. However, Ohio’s exception is not entirely satisfactory. It is not uncommon for a cyclist’s speed to be greater than half the maximum posted speed limit, while still being unnecessarily slow for a following motorist. For example, it is well within the range of normal conditions for cyclist to be traveling at 20mph in 30mph zone or even 30mph in a 50mph zone (going down a hill, for example). 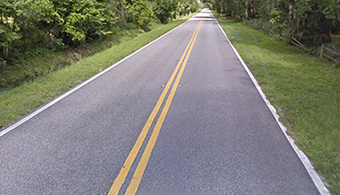 If the road is straight, then sight distance would likely be adequate for a motorist to pass this cyclist safely and without exceeding the maximum posted speed limit. When passing a pedestrian, bicycle, tractor, or other slow moving vehicle, the operator of a vehicle may drive on the left side of the center of a roadway in a no-passing zone when such movement can be made in safety and without interfering with or endangering other traffic on the highway. Alternatively, states could redefine the meaning of the solid centerline from a statutory prohibition on passing to a warning that passing may be unsafe. This is already the case in some states, such as Vermont (the Vermont statute requires signs, not solid striping alone, to define a no-passing zone). All of the other laws restricting passing due to oncoming traffic and limited sight distance would still apply. We ask that legislators modernize their passing laws to reflect safe and practical passing practices, and that cycling advocates make a priority of lobbying them to do so. The vast majority of motorists are already crossing solid centerlines to pass cyclists today. What isn’t happening is a substantive public discussion about how to do it safely. Changing the law to reflect prudent behavior will facilitate this discussion as well as better public education and more effective law enforcement. We at I Am Traffic believe that relaxing the solid centerline no-passing rule is essential to reducing sideswipes, unsafe close passing, and harassment of bicyclists on two-lane roads. We ask that legislators modernize their passing laws to reflect safe and practical passing practices, and that cycling advocates make a priority of lobbying them to do so. (1) No vehicle shall be driven to the left side of the center of the roadway in overtaking and passing another vehicle proceeding in the same direction unless authorized by the provisions of this article and unless such left side is clearly visible and is free of oncoming traffic for a sufficient distance ahead to permit such overtaking and passing to be completed without interfering with the operation of any vehicle approaching from the opposite direction or any vehicle overtaken. In every event the overtaking vehicle must return to an authorized lane of travel as soon as practicable and, in the event the passing movement involves the use of a lane authorized for vehicles approaching from the opposite direction, before coming within two hundred feet of any approaching vehicle. (c) When the view is obstructed upon approaching within one hundred feet of any bridge, viaduct, or tunnel. (3) The department of transportation and local authorities are authorized to determine those portions of any highway under their respective jurisdictions where overtaking and passing or driving on the left side of the roadway would be especially hazardous and may by appropriate signs or markings on the roadway indicate the beginning and end of such zones. Where such signs or markings are in place to define a no-passing zone and such signs or markings are clearly visible to an ordinarily observant person, no driver shall drive on the left side of the roadway within such no-passing zone or on the left side of any pavement striping designed to mark such no-passing zone throughout its length. 1. Passing on left. An operator of a vehicle passing another vehicle proceeding in the same direction must pass to the left at a safe distance and may not return to the right until safely clear of the passed vehicle. An operator may not overtake another vehicle by driving off the pavement or main traveled portion of the way. 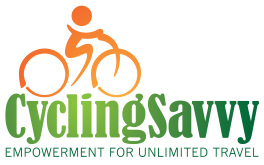 (1) While passing a bicyclist on a roadway, a motorist shall leave a safe distance of not less than three (3) feet between his vehicle and the bicyclist and shall maintain such clearance until safely past the bicycle. (2) A motor vehicle operator may pass a bicycle traveling in the same direction in a nonpassing zone with the duty to execute the pass only when it is safe to do so. (A) The department of transportation may determine those portions of any state highway where overtaking and passing other traffic or driving to the left of the center or center line of the roadway would be especially hazardous and may, by appropriate signs or markings on the highway, indicate the beginning and end of such zones. When such signs or markings are in place and clearly visible, every operator of a vehicle or trackless trolley shall obey the directions of the signs or markings, notwithstanding the distances set out in section 4511.30 of the Revised Code. (b.1) Overtaking pedalcycles.–It is permissible to pass a pedalcycle, if done in accordance with sections 3303(a)(3) (relating to overtaking vehicle on the left) and 3305 (relating to limitations on overtaking on the left). 41-6a-708. Signs and markings on roadway — No-passing zones — Exceptions. (1) (a) A highway authority may designate no-passing zones on any portion of a highway under its jurisdiction if the highway authority determines passing is especially hazardous. (b) A highway authority shall designate a no-passing zone under Subsection (1)(a) by placing appropriate traffic-control devices on the highway. (b) any pavement striping designed to mark the no-passing zone. (b) to a person operating a vehicle turning left onto or from an alley, private road, or driveway. 41-6a-701. Duty to operate vehicle on right side of roadway — Exceptions. 346.09 Limitations on overtaking on left or driving on left side of roadway. (a) Except as provided in par. (b), the operator of a vehicle shall not drive on the left side of the center of a roadway on any portion thereof which has been designated a no-passing zone, either by signs or by a yellow unbroken line on the pavement on the right-hand side of and adjacent to the center line of the roadway, provided such signs or lines would be clearly visible to an ordinarily observant person. I was born in 1977. I am principally a math teacher and have been teaching since the age of 17. I have a B.E. in computer engineering from SUNY Stony Brook (2000) and a Ph.D. in mathematics from Umass Amherst (2008). In the Society for Creative Anachronism, I am Lord Eli of Bergental, member of The Order of the Fountain. I first learned to ride a bike, in the common sense, at age 7. Due to a visual disability I cannot acquire a driver’s license. I once thought of this limitation as a severe one. I made some trips by foot, bike, and bus, and relied on friends and family members with cars to give me rides for some other trips. For the most part, however, the difficulty I had in traveling prevented me from living what most people would consider a full life. I learned to DRIVE a bike at age 27, and it radically transformed my life. Suddenly, I could go wherever I wanted, whenever I wanted, in a reliable, flexible, carefree manner. It felt as if I was no longer disabled. Now I travel almost entirely by bicycle. I have found that good cycling habits provide me with more freedom and flexibility than I could ever achieve through driving a motor vehicle. I have cycled in ten states and the District of Columbia, on a wide variety of roads under a wide variety of conditions. I have made trips of up to 200 miles. I think the Ohio statute is on the right track, specifying a speed when the passing exception is enabled. I also think there is value in requiring an overtaking motorist to first slow to the speed of the slow moving vehicle before making the pass. This would permit the drivers of the faster vehicles the time and presence to look ahead for and assess the potential conflicts created by intersections, terrain, and oncoming bicyclists rather then just moving directly into the left lane. I have had experienced such passes while driving my bicycle in a left turn lane, something which a poorly written law might not address. Great article! I agree with your arguments; however, since NC is a contributory negligence state, this law needs to be changed as well. I would not want a cyclist cyclist for contributing negligence to any crash due to lane positioning when a car fails to overtake successfully. Let’s figure out how to change this in NC and the remaining other states to protect cyclists rights to operate their vehicles as safely as possible. Pamela, blaming a cyclist for the poor decision making or execution of a pass by a motorist, when the cyclist is operating predictably and legally, is a misapplacation of responsibility and liability. You say that like all of us cyclists are riding around without any unsure movements. I did a Gran Fondo this last weekend and at the end I saw quite a few wobbly riders. Thanks, Brian. I made the correction. Utah also fixed their State code last year as well, it includes both no passing zones AND the Two-Way-Turn-Lanes. For this to work it is all about respect. People today are just not tot to respect others unless there is something in it for them! You should always ride defensively is no reason to be right and then be dead proving the point! We have lost too many cyclists to really think the 3 foot rule will protect us. I agree that it is good to fix these laws if possible; realistically I’d probably decide how to direct effort based on problems bicyclists are having in different jurisdictions. Normally “impeding traffic” is defined as driving a motor vehicle slowly (PA Title 75 Section 3364, DE Title 21 Section 4171), yet police in PA and DE may still tell bicyclists they are subject to citation for impeding traffic if they are not as far right as possible (next to the curb, NOT practicable). This is particularly galling when the bicyclists are going slowly to avoid hitting motorists in front of them. I’ve also found motorists are sometimes confused about how to safely pass bicyclists that are riding at or above the speed limit in narrow lanes. They generally are not as impatient with other motorists driving at the speed limit. Do you know of any US cities without these problems? Otherwise, bicyclists are still threatened with citations for imaginary violations when motorists violate laws that exist. Seems to me that the rationale in paragraph 3 is quite a slippery slope. For example, why should folks (motorists OR cyclists) Stop at Stop signs if the intersection is clear of any other traffic? Changing existing laws to permit crossing a double yellow to pass a cyclist safely is IMO, a good thing to encourage. Encouraging people to decide it’s clear, I’ll pass on a double yellow seems ill advised to recommend. I do have a problem with the illustration of control (catch) and release. The cyclist makes arm motions that look like left turn and right turn, yet proceeds straight ahead. I would suppose a very high percentage of motorists would be baffled by the movements and annoyed that the cyclists first signals left and doesn’t turn. Secondarily, I would guess that these actions open the cyclist up to liability for directing traffic? Meaning, the cyclist thinks it’s clear to pass, indicates so and the passing car collides with a car pulling out of a driveway. Or swerves back into the lane and takes out the cyclist. The following video shows an announcement by Austin police that motorists will not be ticketed for crossing a double yellow line to pass a cyclist as long as they do so safely. Our local highway and traffic department has striped a “bike lane” on the shoulder of a busy road. Much of the bike lane is split between “road grade” pavement and “shoulder grade” pavement by a meandering line. Are there any standards at all for condition of the paved surface in a bike lane? Successful bicyclist behavior is driven by knowledge of common crash types and the behaviors needed to successfully avoid them. This article explores the characteristics and consequences of bicyclist behavior.